In my newest series, the MacDougall Legacy, we follow a family through the generations, starting in 1207. Every hero takes his place as Laird MacDougall of Dunstaffnage Castle. Legends abound within the series, many with a mystical element. The history of Scotland is seeped in mysticism, and so most of the elements I’ve added into this series are based on historical fact or legend. Why did I choose this castle as the setting? I love a good ghost story, and in my travels to Europe, I’ve often felt the otherworldly presence of those who lived in the past. One of my favorite castles in Scotland is Dunstaffnage Castle, and I was lucky enough to visit there on my last trip! The history behind it is fascinating and haunting. 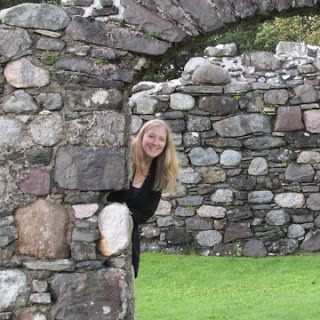 There is this tale of a glaistig, or green lady, who haunts the grounds of Dunstaffnage. She is called the Ell-Maid of Dunstaffnage, but no one knows who she might have been. She appears in green, gliding over the walls, and through the forest. Her appearances often were brought on by tidings of joy or sadness within the family. This gave me an idea—in fact, it sparked the whole series! 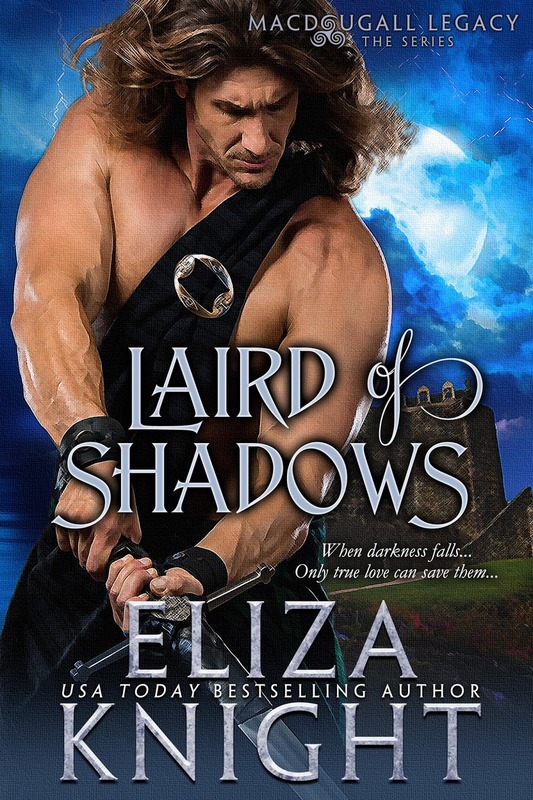 In Laird of Shadows, we learn the origin of the Ell-Maid of Dunstaffnage… It was exciting to write this story, and I can’t wait for you all to read it, and to see what happens as I follow the MacDougall family throughout generations in my new series! Here are a few pictures I took at Dunstaffnage Castle. The castle through the forest. A model of the castle. The entry corridor from the main door. Standing on the ramparts looking down. This section here would have had a roof like you saw in the model. On the ramparts looking out on the water. Inside a tower, looking out. More of the inside, and the well. Inside a tower, the floors are no longer there, but you can see the shelves and hearths from upper floors. More inside, showing stonework on multiple floors. Crumbled stairs inside one of the towers. Inside the bailey looking up at the tower walls. The stonework is amazing. A forest trail to the castle kirk. A cross on the side of the kirk. More of the forest surrounding the castle. The second book in my series, Laird of Twilight, will release in The Forbidden Highlands, April 18th! Available for Pre-Order! I would love to go to Ireland again, have been there twice but would love to spend more time in Dublin, just hubby and I, no tour. Aside from being Irish..lol, I just love the history. I think my favorite places were all the castles and abbey ruins we saw but Glendalough was particularly inspiring to me. I followed your whole trip on FB. Thanks for sharing! Eliza, Is the second book going to be available in regular book form, or just ebook? Luck of the Irish or Just Sheer Irish Grit?